Abcam's Adipolysis Assay Kit (ab133115) provides a convenient tool for studying the adipolysis of triglycerides in differentiated 3T3-L1 cells, using a common adipogenesis induction procedure. This kit will allow investigators to screen compounds involved in lipid storage and metabolism. Isoproterenol is included in the kit as a positive control for screening pharmaceuticals that regulate FFA release from adipocytes. Triglycerides stored in these lipid droplets can be stimulated by known factors or compounds to release FFA and glycerol. The latter can be measured by incubation with glycerol kinase, glycerol phosphate oxidase, and horseradish peroxidase in the presence of a colorimetric substrate to generate a chromophore detectable at 540 nm. The amount of glycerol released into the medium is proportional to the level of triglyceride storage and/or degree of adipolysis. Obesity is a risk factor in many of the major chronic diseases such as diabetes mellitus, and cancer. The ability to regulate the number of fat cells and/or the size of fat cells is a key in the development and physiology of obesity and also in the origin of chronic disease. Adipose tissue plays an important role in energy homeostasis. Mammals have both brown adipose tissue (BAT), which utilizes lipids to generate heat in a process known as thermogenesis, and white adipose tissue (WAT) which stores excess energy as triglycerides in lipid droplets. Triglycerides can be broken down into free fatty acids (FFA) and glycerol, through a process of adipolysis (also referred as lipolysis). Adipolysis is a highly regulated process which allows appropriate delivery of FFA to meet energy needs. Appropriate FFA levels are important for optimal human health but excess FFAs are generally associated with development of insulin resistance, hypertriglyceridemia, reduced hepatic insulin clearance, and impaired ß-cell insulin secretion. Adipolysis is under tight hormonal control. 3T3-L1 cells are a well-characterized model for studying lipid metabolism, including the uptake and release of fatty acids from fat cells. This model shares similar morphology, gene expression, and metabolism with adipocytes in vivo. During terminal differentiation, the fibroblast-like preadipocytes undergo a series of morphological and biochemical changes to eventually accumulate lipid droplets. Differentiated 3T3-L1 cells were treated with increasing concentrations of isoproterenol for 48 hours and the culture supernatant was assayed for free glycerol. Top panel: glycerol release from undifferentiated (red) and differentiated (blue) 3T3-L1 cells as determined using Free Glycerol Assay Reagent. 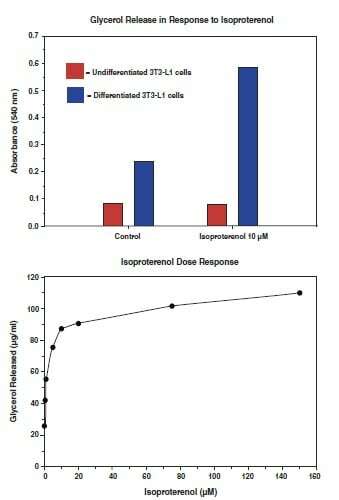 Bottom panel: isoproterenol dose response curve showing glycerol released after 24 hours versus isoproterenol concentration. Example of standard curve of typical data produced with 3T3-L1 culture medium. Upon induction, 3T3-L1 cells differentiate into adipocytes-like cells and they are ready to be used for adipolysis experiments. Panel A: non-differentiated 3T3-L1 cells show no staining of Oil Red O Solution. Panel B: increased lipid droplet accumulation indicates that more than 80% of preadipocytes were differentiated into adipocytes four days after weaning the cells from Induction Medium to Insulin Medium. ab133115 has not yet been referenced specifically in any publications. There are currently no Customer reviews or Questions for ab133115.